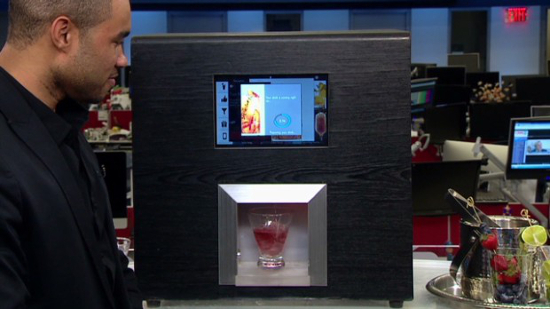 How would you feel about having a robot make your drink? You might soon find out. Robotic bartender Monsieur - which earlier this year was the subject of a successful Kickstarter campaign - has recently received funding from a group of powerful, influential investors. Among them are NFL star Derrick Morgan, NBA player Glen Davis, Paul Judge, TechSquare Labs, Base Ventures, and BIP Capital. In other words, it's looking like this artificial bartender is getting some big business. According to The Spirits Business, this funding will allow Monsieur's inventors to roll the robot out across the United States by the end of the year. What that means for all you barflies is that you're going to start seeing Monsieur robots popping up in your pubs and taverns before 2016. Given that Monsieur was originally intended for use around the house, this is pretty huge. Unfortunately, if you're expecting to stroll into a bar and have a cybernetic face greet you with a drink, you'll be sorely disappointed. Monsieur isn't a humanoid robot. As a matter of fact, it's more of an intelligent vending machine than anything else. So why does it have everyone so excited? Well for one, it's both incredibly smart and very convenient. It can expertly recommend a drink based on your personal preferences (which it learns over time), and it allows users to order either from the decide or remotely via a companion app. It's Bluetooth. WiFi, and Zigbee-enabled; for business owners, Monsieur is also equipped with commercial business analytics and monitoring software. "People want smart, connected devices that provide great design, choice, and convenience," explained Monsieur Co-Founder and CEO Barry Givens. "Monsieur is the first to deliver that for bartending and cocktails." If you're thinking Monsieur might be the perfect addition to your home or bar, it'll run you at roughly $4,000. You'll also have to pre-order one from the second shipment of models - the first batch has already sold out. Is Space Turning Into the Next Tourist Hot-Spot ?